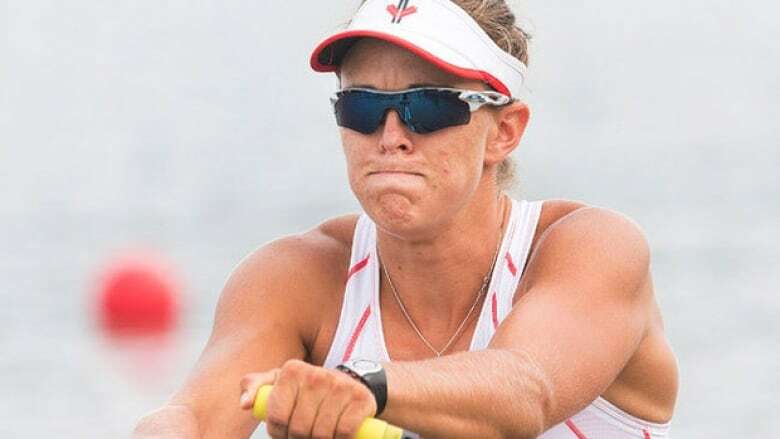 Canada's Carling Zeeman won gold in the women's single sculls event on Tuesday, while Liz Fenje and Katherine Sauks earned a first-place finish in the lightweight double sculls. Canada added three rowing gold medals to their Pan American Games total at the Royal Henley course on Tuesday morning. Canada now has a total of seven rowing medals — five golds and two bronze — with one more day of racing to go. Carling Zeeman won gold in the women's single sculls. That victory was followed in the next race with a gold medal in the women's lightweight double sculls by Victoria's Liz Fenje and Katherine Sauks of Owen Sound, Ont. Canada finished the day of racing by winning the men's quad sculls. "It was my plan to go out hard and stay out in front," said Zeeman, who was more than seven seconds ahead of her singles competition with a winning time of seven minutes 30.86 seconds. The 24-year-old from nearby Cambridge, Ont., crossed the finish line in front of extended family and old friends. "It's kind of a special moment for me," she said. "And it really touches me that everyone is coming out to watch. It is a rainy day but it's certainly not dampening any spirits at the finish line. The momentum they have going down there is just, it's unbelievable. I love it. It just adds to the fun of racing." Katherine McFetridge of the United States took silver in 7:38.21 and Soraya Jadue of Chile won bronze in 7:43.34. In the women's lightweight double sculls Fenje and Sauks won with a time of 6:57.23. Cuba took silver in 7:00.36 and the United States won bronze in 7:03.86. "We actually didn't have the greatest first couple of strokes in our race, but suddenly we just locked into it and felt ourselves pulling away," said Sauks. The Canadians had built almost a four-second lead in the first half of the race before the Cubans started to make a move in the final 1,000 metres. "I think we were able to push against the Cubans," said Fenje. "They made a great move. They're great racers. Big respect. We were able to counter, though." In men's quadruple sculls, Matthew Buie of Duntroon, Ont., Julien Bahain of Sherbrooke, Que., Will Dean of Kelowna, B.C. and Rob Gibson of Kingston, Ont. also led the entire race and won with a time of 5:42.22 seconds. Cuba won silver in 5:44.39 and Argentina won bronze in 5:47.14. Buie spent two summers on the Royal Henley course with the St. Catharines Rowing Club, and the experience paid off as the water got rougher along the course. "Going out right off the start we wanted to get a solid lead because we knew once we came down here (the midway at Henley Island) it could get pretty rough and it's really hard to come back from behind in this rough water," he said. The boat was filled with experience, including Bahain who has an Olympic bronze in this same event when he rowed for France in 2008, and Rob Gibson who was a member of Canada's silver-medal eights crew at the London Olympics. Buie won bronze a day earlier in men's double sculls. Gibson still has the singles final on the final day of rowing competition while Dean and Bahain will be part of the men's eights.